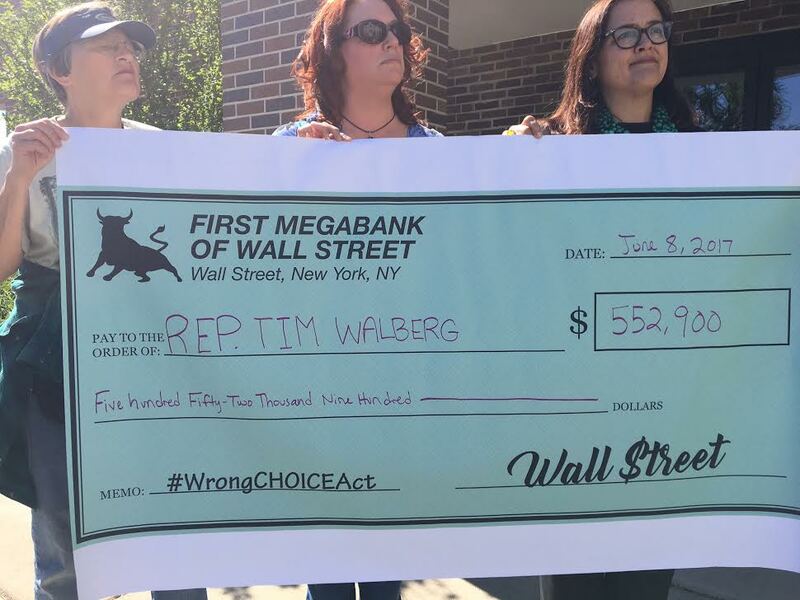 Like Donald Trump, Tim Walberg always seems to be on the lookout for ways to hurt the voters of Michigan’s 7th district, which Walberg allegedly serves. He’s already voted to uninsure 33,700 of his constituents, putting 14,390 with pre-existing conditions at risk of never being able to find affordable coverage again, by supporting Trumpcare both in committee and in the full House vote. And on Thursday he voted to put Michigan and America back at risk of suffering a financial crisis like the one that began in 2008 and from which we’re still recovering. The so-called CHOICE Act, which passed the House with only one Republican defection, allows banks to evade all the consumer protections in the Dodd-Frank Wall Street reform bill and regulate themselves if they keep a 10 percent leverage ratio. That’s about one-third of what Anat Admati, a professor at Stanford, says is sufficient to keep theses institutions solvent during a crisis. Banks would then have the ability to continually delay meeting that 10 percent requirement so liberally that they may never have to satisfy it, David Dayen explained on The Dig podcast. The CHOICE Act also eliminates key consumer victories like the Volcker Rule, which prevents banks from gambling with deposits, and the fiduciary rule, which prevents financial advisors from screwing over their clients. The law also targets the most consumer friendly portion of Dodd-Frank — the Consumer Financial Protection Bureau — which was inspired by Elizabeth Warren and has already returned more than $11.8 billion to individual Americans. “It also gives Congress purview over the CFPB’s budget, meaning lawmakers could defund the agency entirely,” CNN Money notes. The president would also be able to fire the Bureau’s Director, especially if the Director is doing an excellent job protecting consumers, the way current chief Richard Cordray is. Nothing will ever cost America more then unregulated bankers did by killing millions of jobs and trillions in wealth when they nearly tanked the global economy in 2008. Home values in Jackson County are still down as much as 28.4 percent compared to what they were just a decade ago. Now Walberg wants to set Donald Trump and the big banks free to run government like a failing casino. You’ll note that Republicans took this vote on Thursday as the nation was Comey-tosed by the dramatic testimony of fired FBI Director. The Speaker of the House moved it up a day early to make sure it was drowned out by the hubbub. Paul Ryan is just savvy enough to know that the pain created by the failure of conservative economics both last decade and over and over again in places like Kansas help feed Donald Trump’s rise. And now, instead of becoming a new populist version of the party determined to learn from their mistakes, they’ve decided that the real lesson of Trump is to behave like Trump — lie and then do whatever you like in private. And what these Republicans like to do in private is transfer trillions of dollars of wealth in the form tax breaks and erased consumer protections. That’s exactly what Tim Walberg was hired to do. Yes, he was rightfully elected by the people of the 7th district but his real employers are deep-pocketed donors from the financial sector exemplified by the Club for Growth, which helped buy him the Republican nomination in the only competitive primary the congressman has faced. According to the Center for Responsive Politics, Walberg has recently received over half a million dollars from that sector. Activists from Michigan United showed up at Walberg’s office in Jackson on Thursday to deliver petitions asking him not to undo the modest but underrated reforms designed to prevent another financial crisis. They also presented him a giant check representing his generous backing from America’s financial industry. “We thought he might show up if we had a check,” Ryan Flaherty told me. Unfortunately, Walberg was in Washington DC representing the bankers who’ve learned nothing from the last financial crisis.